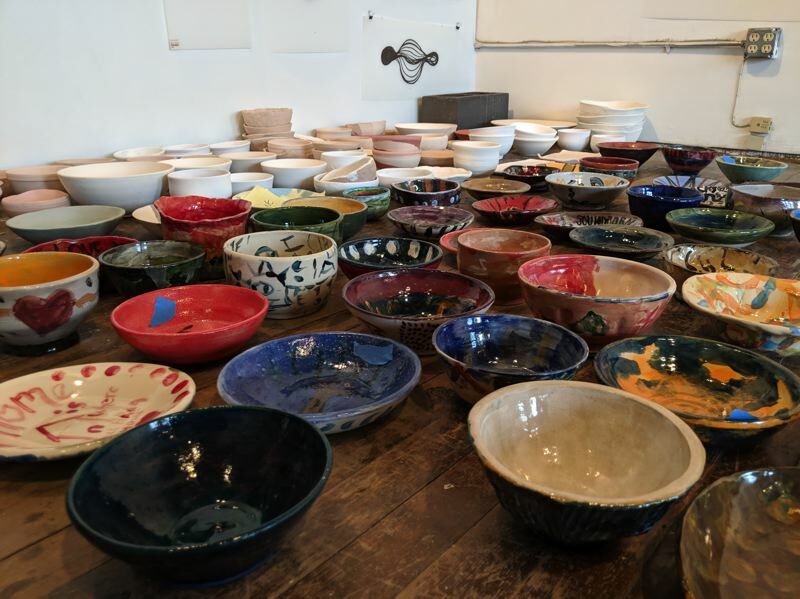 Sculptor Dana Lynn Louis has collected more than 500 ceramic bowls and taught 60 2-1/2 hour workshops for people to paint them. Many of the painters were people experiencing houselessness, as she put it, and all were given $20 cash and a free T-shirt for their efforts. 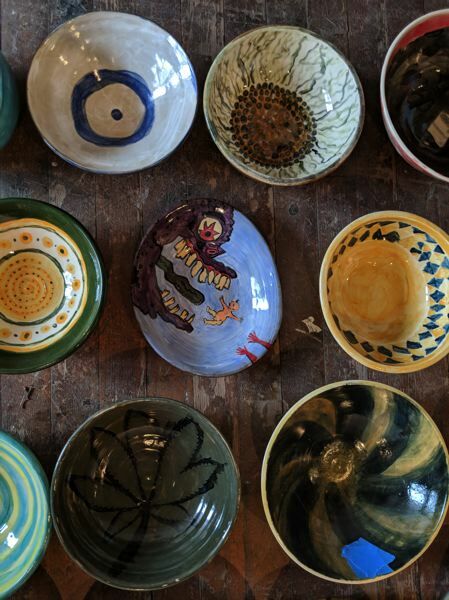 As part of her "Gather: Make: Shelter" project, the bowls will be on sale to the public in Pioneer Courthouse Square, noon-4 p.m. Sunday, Sept. 23, and the proceeds will go to one or two nonprofits of her choice to help people into housing. In a city of bleeding hearts and do-gooders, where there are nonprofits about starting a nonprofit, Louis' effort stands out. 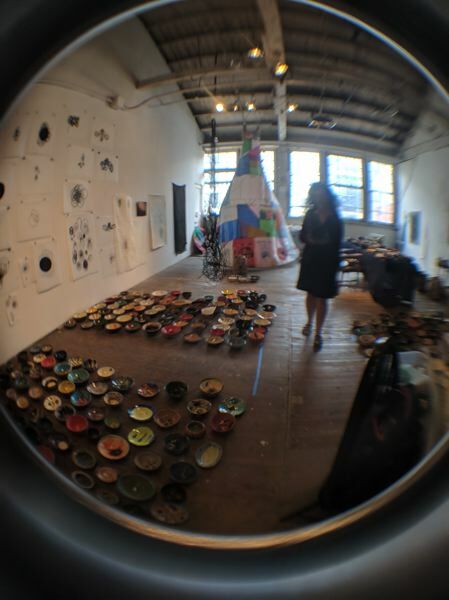 She is a respected artist who has shown at the Portland Art Museum and is on the books of the Russo Lee Gallery. She's had her studio in Carton Service, an old warehouse on Northwest Front Avenue, for 28 years. And it shows. 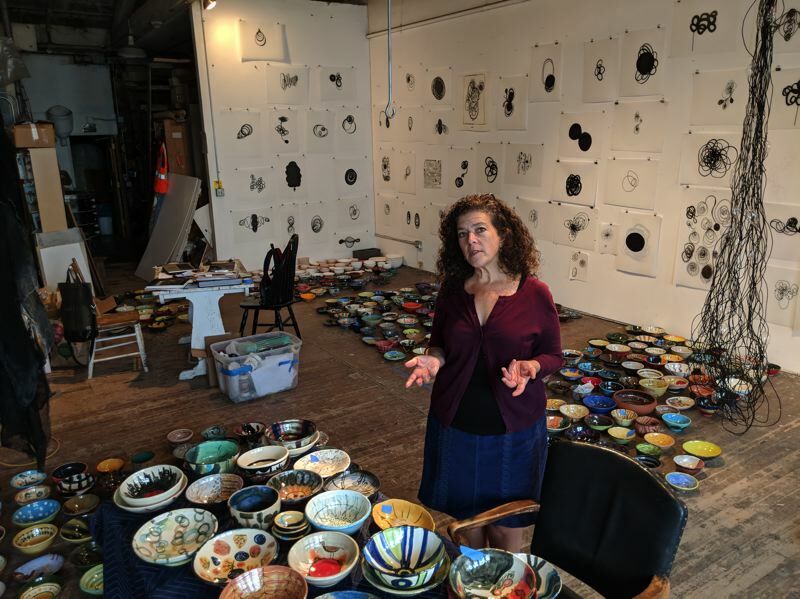 The place was a warren stuffed with drawings, sculpture parts, molds, racks and boxes, and that was before she cleared the floor to store hundreds of the painted bowls. "In Senegal everyone was so positive. Everyone says hello to strangers in the morning, and if they know you a little bit better they ask, 'How did you sleep?'" she says. She came back to the United States to a land that had just been through "that election," as she puts it, and everyone she knew was being so negative, about everything from national politics to gentrification. She considered fleeing Portland, then decided to try to do some good in the city she loves. Louis was inspired by Street Roots, having noticed over the years people buying the newspaper have gone from gingerly offering their cash to now being on first-name terms with the homeless vendors. 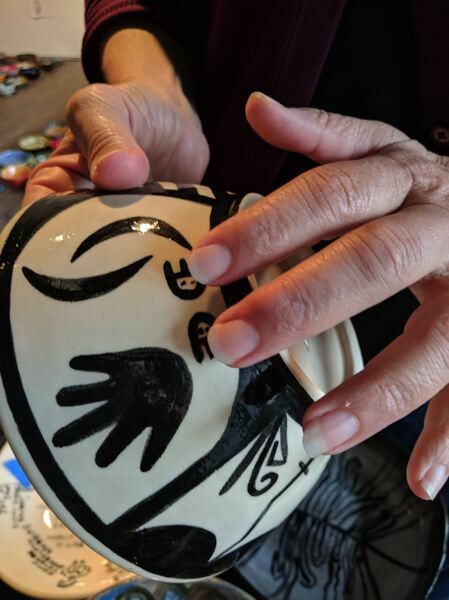 "I wanted to do something more than an ask or paddle raise," she says, talking about the typical display of conspicuous donations at charity galas. She wanted something that was more than a transaction. "I wanted people to come to this on many different levels and invest themselves, and their money, food, creativity, to make this project." After meeting with many social service agencies starting in October 2017, she heeded their suggestions that she should donate any money raised to one or two charities, not the portfolio of 15 she had in mind. "Gather: Make: Shelter" was born. 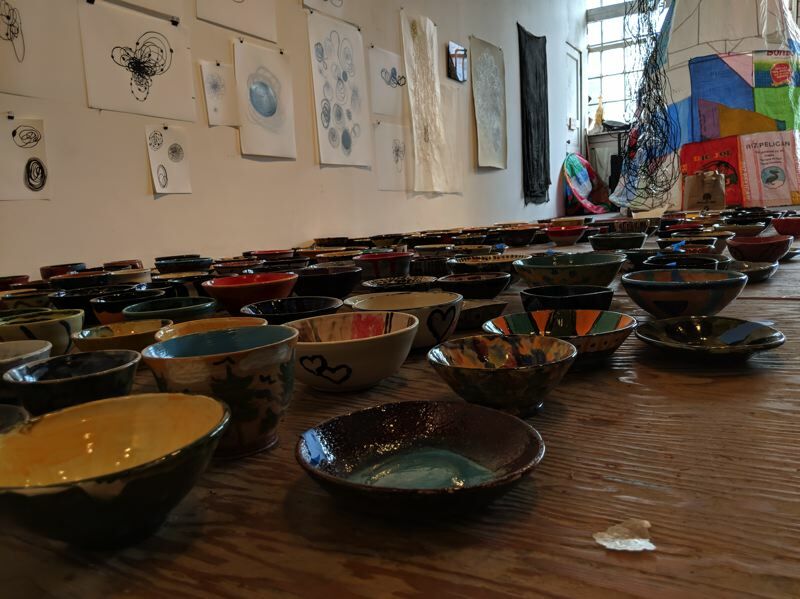 To make the bowls she rallied ceramicists ranging from architects to faculty and students at Oregon College of Art and Craft and Grant High School. 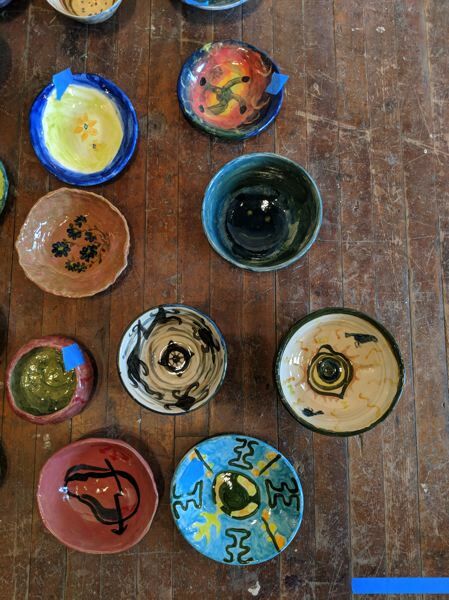 The bowls are mostly seven inches across, but some are small pinch pots and some are deluxe serving bowls. 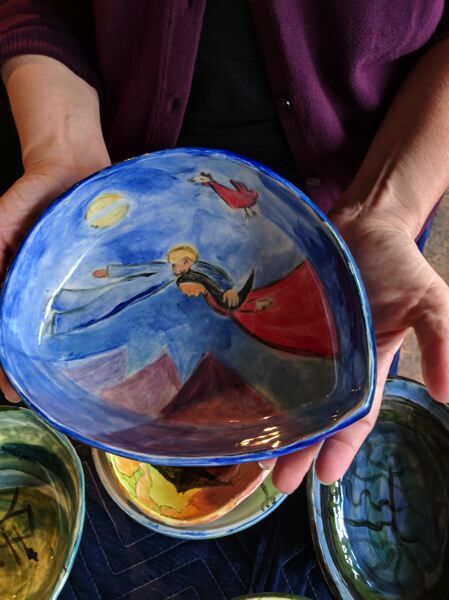 Most of the modest bowls will be priced between $25 and $65, but the grander ones will be in a silent auction. "I thought I might get 100 people and have a potluck in a park, but it kept growing," she says. 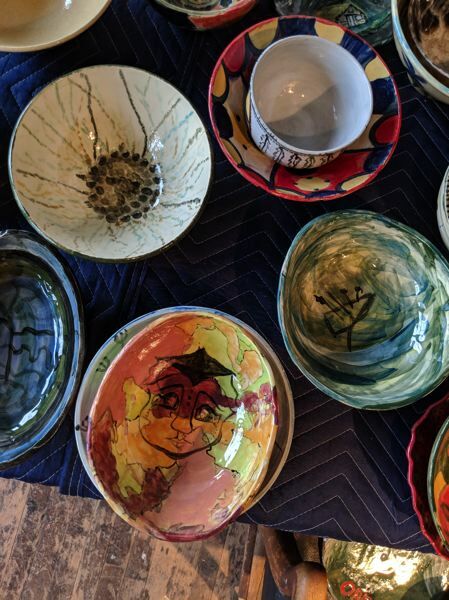 By now, 400 people who are currently or have previously experienced homelessness have taken her painting workshops in 13 different locations, and they have painted 500 bowls. Typical social practice art, which has blossomed in the past two decades, could be asking gallery visitors to tie ribbons in a Rapunzel-type braid, for example in "Ties of Protection and Safe Keeping" by MK Guth. Louis prefers to call "Gather: Make: Shelter" a "citywide creative collaboration," or a "big love bomb." She has a thank you list like an Oscar speech. Every few sentences she stops to name-check someone who helped, from "chief schlepper" Dave Airhart, who carried bowls up and down the warehouse stairs, to landlord Ken Unkles and his wife Mary, and philanthropists Lindley Morton and Corrine Oishi. They gave cash donations to kickstart the projects when she failed to win grants. Louis stresses that the workshops were educational, and not like class where you drink some wine and paint a premade clay trinket. She brought in art history books and encouraged others to do so. Most people were grappling with painting a three-dimensional object for the first time. She stopped bringing in red paint because it was so popular and all the pots were starting to look red. One guy painted scenes from his Alaskan childhood, another was a Second Mesa Hopi Native American who signed his pots with the double bear claw mark. After eight months the project culminates this Sunday. The food will be made by people from Sisters of the Road and the Victory Project PDX, which is run by Amalie Roberts of Kir wine bar. The Victory Project is a charity teaching culinary skills so people can help themselves out of homelessness. "Come buy a bowl, get some food (in a disposable bowl) and hear some music," Louis says. "We've got acts including the Maybelle Choir, Edna Vazquez and the Karen Lovely Band and poetry reading by Street Roots vendors. And the painters will be there." And hopefully, the art patrons will talk to the homeless people, and they will ask each other how they slept.